Sometimes a single phone call can change everything. Until now, the BLOSSOM, the only watch in the world that is completely skeletonised, guilloché and engraved by hand by GRIEB & BENZINGER, has only been available for men. However, a report in a luxury magazine in Dubai from the summer of 2012 was destined to change all this; a Russian businesswoman, who is also a passionate watch and jewellery connoisseur, became aware of the personal service available by GRIEB & BENZINGER. 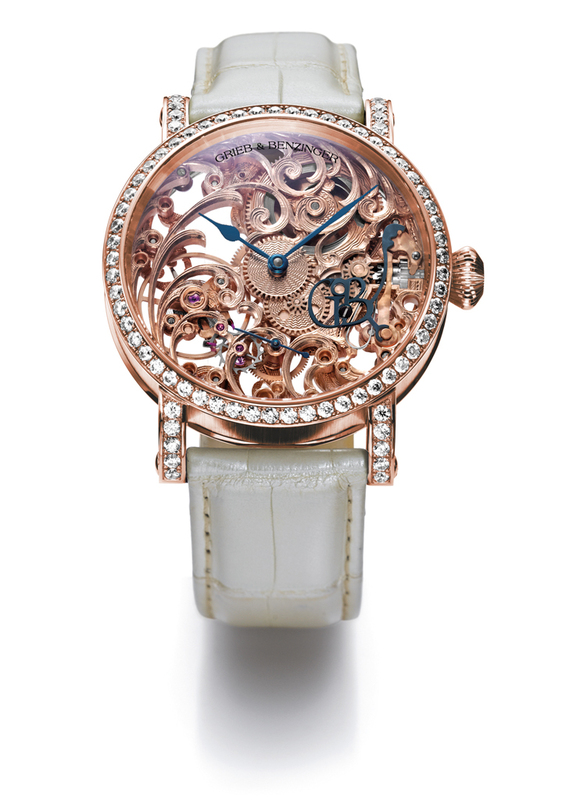 Now the stunning new skeletonised watch known as PEARL BLOSSOM has been created thanks to her interest and foresight. Following a few telephone calls and e-mails with the GRIEB & BENZINGER workshop, it became clear that a new BLOSSOM for female watch lovers was a must! The exceptionally elegant PEARL BLOSSOM, is a feminine variation of the classic skeletonised watch in a 43 mm red gold case set with 2.55 ct. 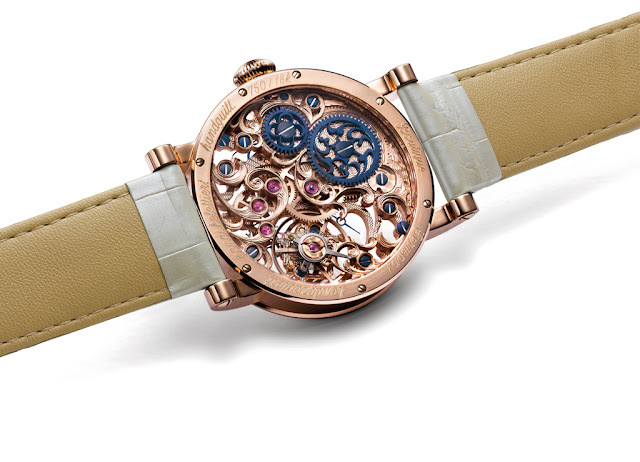 The watch also features top Wesselton diamonds and an alligator skin strap in a creamy mother-of-pearl colour. The new feminine version adds to the BLOSSOM family, whose masculine version – the BLACK TULIP – was created only a year ago on the special request of a US pop star. Full skeletonisation in floral pattern - elegant, exceptional. 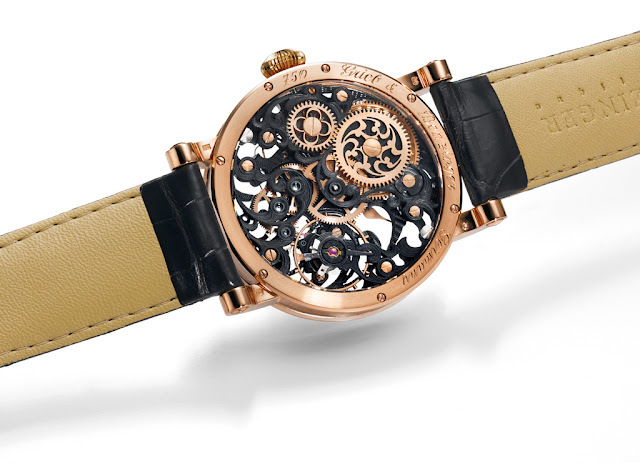 The movement has been skeletonised, guilloché and engraved fully by hand. Solid 18-karat red gold case 43 mm in diameter and set with 2.55 ct diamonds. Alligator skin strap in a creamy mother-of-pearl colour with an 18-karat gold buckle. Full skeletonisation in floral pattern - mysterious, impressive. 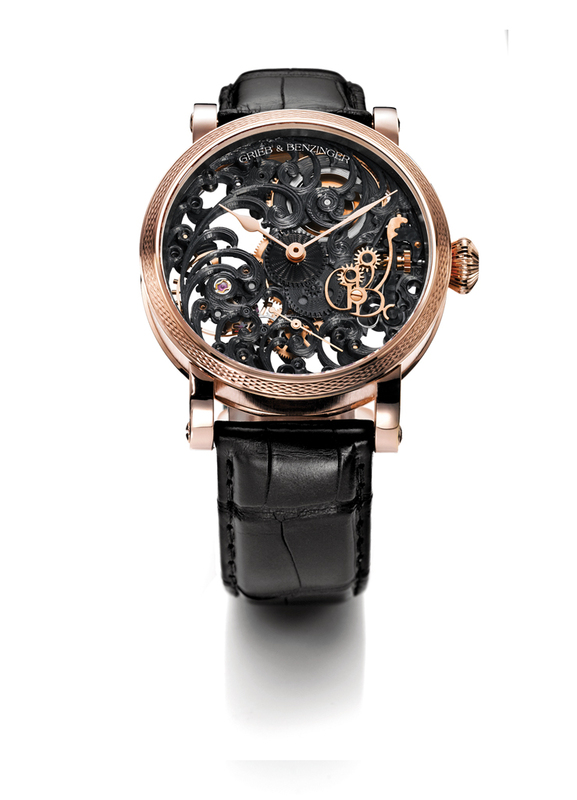 The movement has been skeletonised, guilloché, engraved and blackened fully by hand. Solid 18-karat red gold case 43 mm in diameter. Black alligator skin strap with an 18-karat gold buckle.